Sizing a load-bearing beam does not require a structural engineer or expensive structural design software. The process involves one simple equation and some knowledge of the loads that the beam will carry. For a porch roof, the beam needs to be sized according to the maximum snow loads in your area, and you must know enough about the porch design to determine how the load will be distributed and over what distance the beam will carry the load. You can perform the structural design for many home improvement projects. 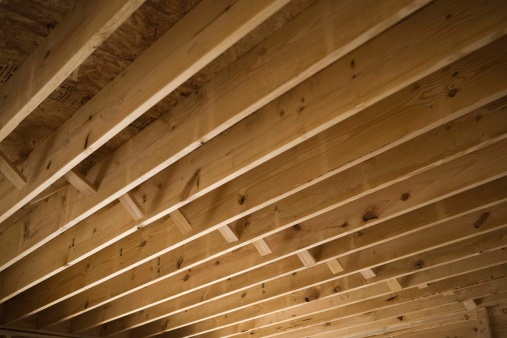 Determine the load per square foot that the roof must support. The roof load is composed of a dead load and a live load. The dead load is constant and is estimated as 10 pounds per square foot for wood-framed construction. The live load depends on the maximum snow load in your area. This information is available from your building inspector or planning department. As an example, most areas of the United States have less than 30 pounds per square foot of snow load, making the total load 40 pounds per square foot. Multiply the load per square foot by the total area of the roof. If an example roof is 10 feet by 20 feet, the total area is 200 square feet; multiplied by 40 pounds per square foot equals 8,000 pounds. This number represents the total load that your roof must carry. Divide the total load according to how many supporting beams the roof will have. If one side of the roof is supported by the house and the other side is supported by the beam, divide the total load by two as the beam is only supporting half of the roof. If there is also a beam in the middle of the roof, divide the total load by three. If our example roof has only one beam, it must carry half of the total load, or 4,000 pounds. Write down the beam strength formula: Total load in pounds = FBd^2 / 9L. Fill in the parts of the formula that are already known. L stands for the span of the beam, in feet. In the example, the beam spans the 10-foot width of the roof. The total load is 4,000 pounds. F stands for the beam's fiber strength in bending, which depends on the species of wood. For the initial calculation, F can be estimated at 1,000. Now the example formula is 4,000 = (1,000)Bd^2 / (9 x 10). Choose a convenient value for B, which stands for the breadth of the beam in inches. A typical beam breadth is 6-inches. Rearrange the formula to solve for d, which stands for the depth of the beam: d = square root of ( (load x 9 x L) / (F x B) ). In the example, d = square root of ( (4,000 x 9 x 10) / (1,000 x 6) ). Calculate the initial value for d, then round it up to the nearest inch. This tells you the size of the beam needed to support the porch's roof. In the example, d calculates to 7.75. 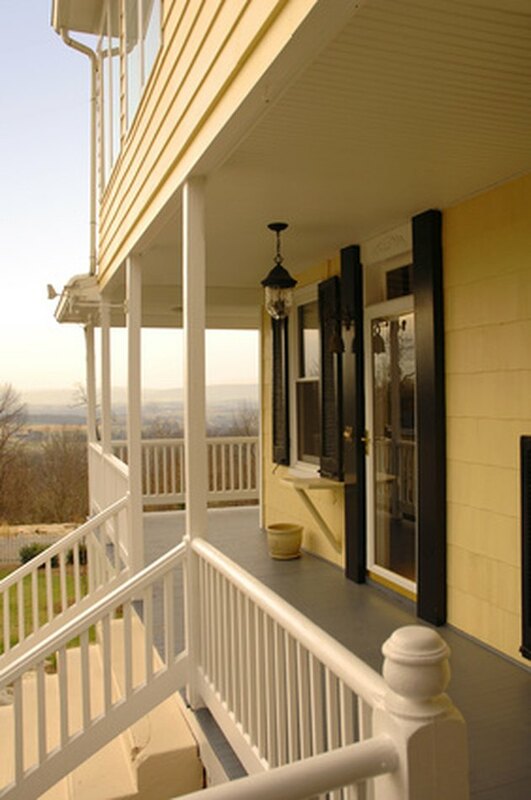 This means the example porch would need a 6-inch by 8-inch beam.